Photograph courtesy Roger Geach. 25254 passes Elstree with a permanent way train on February 23rd 1979. The twenty year six month career of D7604/25254 included allocations to Eastern, Scottish & London Midland Region depots. Time between last Classified repair and withdrawal: 105 months. Time between withdrawal & scrapping: 32 months. Renumbered to April 20th 1974. 25254 was the 292nd Class 25 withdrawn, one of seven retired during September 1986. After withdrawal 25254 was stored at Springs Branch until moved on May 24th 1989 to Leicester Humberstone Road and into Vic Berry's yard the next day. By the third week of June 1989 25254 had been scrapped. Noted Glasgow Works October 1968. 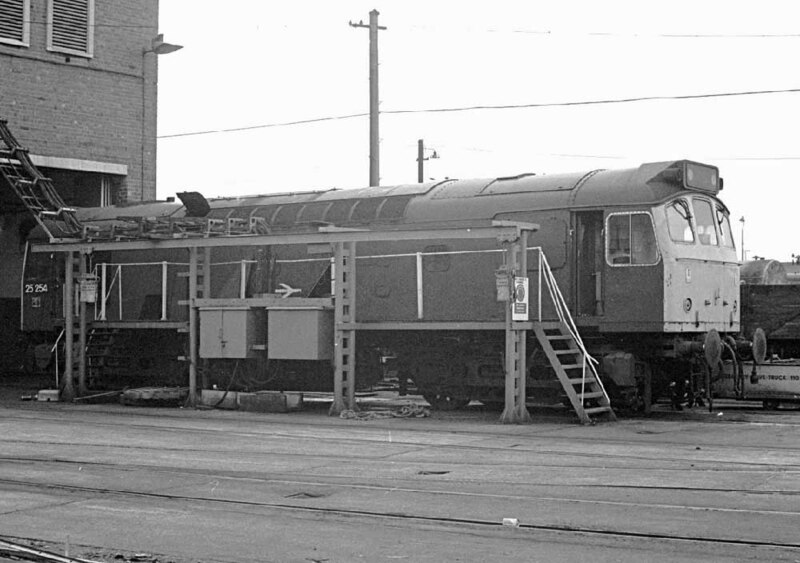 Noted Derby Works February 1975. Noted Derby Works October - November 1977 (Classified & full repaint). Noted Derby Works April 1982. D7604's time at the Eastern & Scottish depots has so far produced no recorded passenger workings. The first recorded passenger working took place on July 12th 1969 with the roundtrip Nottingham - Llandudno Town. A rescue job took place on October 26th when Class 45 No.77 working the 18.00 Derby - St. Pancras failed at Finedon Road, 7604 dragged the service to its destination. On July 29th 7604 worked the 21.30 Leicester - Birmingham New Street. At least two roundtrips were made to Skegness from Leicester during 1974, on July 20th with 25259 and on August 10th with 25133. On April 22nd a southbound loaded merry-go-round coal train was noted behind 31422 & 25254 at Glendon Junction, presumably deputising for a Class 47. 25254 & 25081 worked the Derby - Norwich - Yarmouth - Norwich - Walsall diagram on August 23rd. The summer dated roundtrip Nottingham - Llandudno Town was worked on July 17th. 1977 produced a little more variety than the previous years. On June 4th 25254 & 25120 worked the roundtrip Walsall - Norwich (for Yarmouth) - Walsall. The next day (5th) the same locomotives worked a Stroud - Barmouth day excursion forward from Wolverhampton, returning with the 17.30 Barmouth - Birmingham New Street as far as Shrewsbury. 25125 & 25254 were noted at Frodingham on July 24th. The 08.44 Leeds - Paignton was worked to Sheffield by 25254 on August 13th. It was a trip over the Cambrian line on August 21st with 25118 on the 08.45 Birmingham New Street - Barmouth to Shrewsbury (assumed), and the return 17.30 ex-Barmouth from Shrewsbury. The passenger workings for 1978 were concentrated in one week during July. On July 22nd 25254 & 25133 worked the 09.19 Manchester Piccadilly - Yarmouth to Lincoln Central, returning with the 09.15 ex-Yarmouth. The same two locomotives on July 23rd to 26th made round trips to Skegness, from Derby (23rd) and Leicester (24th, 25th & 26th). At about 3pm on August 8th 25254 was noted with a southbound permanent way train at York. The 03.55 Rugby - Didcot parcels was worked by 25254 on September 28th and instead of returning light engine worked the morning Poole - Manchester forward to Birmingham New Street. December 12th was a poor day for Class 25 reliability in the Northampton area. A Tring Cutting – Dam Mill mgr train which went forward from Northampton with 25285, after 25254 had been cut off here, got no further than Althorp before expiring. 25284 pushed the train to Rugby, ran round and took the train on to its destination. The early afternoon Peterborough - Crewe parcels was worked by 25254 on March 24th. Seaside resorts were the order of the day for 25254 during 1980. On July 5th 25254 & 25258 worked the Walsall - Norwich - (for Yarmouth) - Derby diagram. The next day the same pair worked a Leicester - Skegness round trip. A week later on July 13th 25254 & 25269 worked a roundtrip Berkhampstead - Scarborough day excursion throughout? An 'E' exam was carried out at Toton during July 1980. The 16.10 Whitemoor - Temple Mills freight was normally a Class 37 turn (via Cambridge and Lea Valley), however on September 3rd 25254 & 25320 worked the train and probably went back on the 20.45 Temple Mills - Whitemoor, both handled by March men. A visit to the Cambrian lines took place on September 20th with 25254 & 25256 working the 07.40 Euston - Aberystwyth from Wolverhampton, returning with 17.55 Aberystwyth - Wolverhampton. 1981 saw a varied set of passenger workings for 25254. On March 3rd the 09.50 Edinburgh - Plymouth failed at Derby behind 47556, 25254 took the train to Birmingham New Street. At Birmingham on the same day a power failure saw 25254 assist the 16.30 Birmingham New Street - Euston as far as Birmingham International. The 05.35 Cardiff - Crewe was worked by 25254 on May 18th. Between May 25th & 31st 25254 & 25243 were busy on the motorails between Kensington Olympia & Willesden. At least five trips were made to Aberystwyth, on June 13th with 25194, June 20th with 25188, July 25th & 26th with 25278, the latter date being a day excursion originating from Gloucester and August 1st with 25262. On September 5th 25254 was north of the border working the 10.35 Stranraer Harbour - Kilmarnock and the return 13.43. Photograph courtesy Dave Smith. 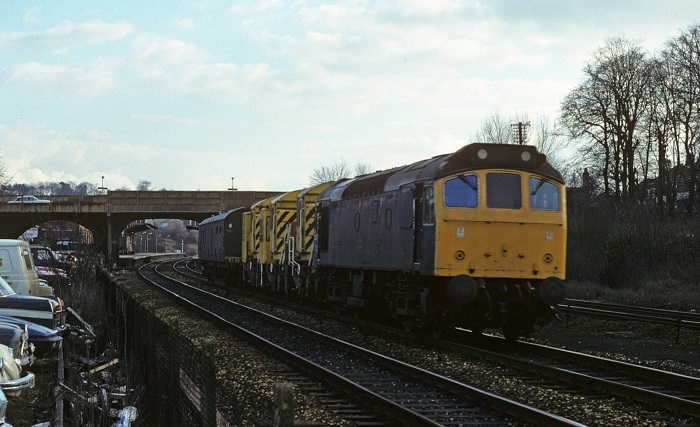 25254 at Nuneaton on March 25th 1981 with its train of Ford cars being routed from the Down slow to the Coventry branch in order to reach Gosford Green. 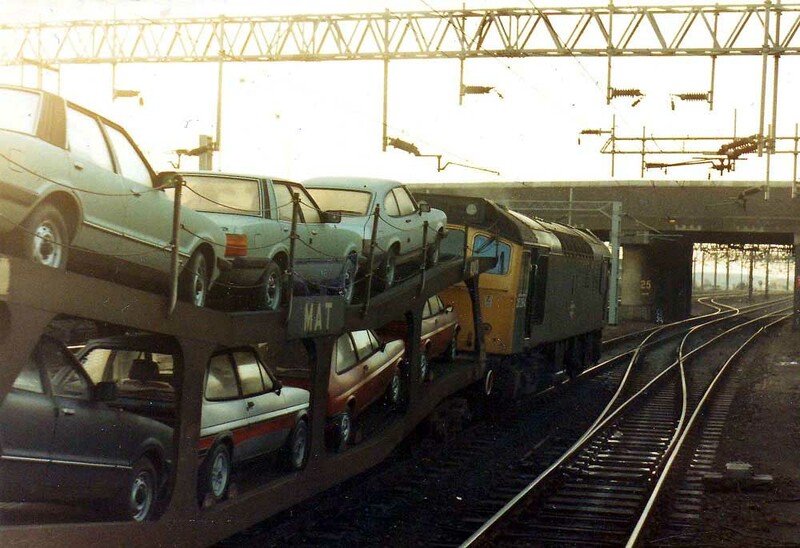 The MAT transporter wagon carries a selection of new Ford Capris, Cortinas and Fiestas, which like the locomotive pulling them have probably been recycled several times over since this picture was taken. On December 11th 25251 & 25254 worked the Leith - Heysham pipes. The passenger workings during 1982 had a northern flavour. On February 26th 25254 handled the 15.15 Manchester Piccadilly - Harwich Parkstone Quay to Sheffield. A short rescue job on August 24th saw 25254 assist 86256 on the 09.15 Glasgow Central - Bristol Temple Meads between Preston & Winwick Junction (via Newton-le-Willows) because of an overhead line failure. The next three workings were north of the border, with 25254 working the 17.22 Carlisle - Glasgow Central on September 4th and the 12.50 Carlisle - Glasgow Central and 17.30 return on September 6th. The 19.25 Bangor - Manchester Victoria on September 20th was worked forward from Llandudno Junction by 25254. Photograph courtesy Tony Sayer. 25254 at the Test House, Derby Works on April 24th 1982. Only one passenger working has been identified for 1983, on November 17th working the 18.20 Glasgow Central - Manchester Victoria between Lancaster & Preston dragging 86232 due to overhead line damage. On February 19th 1984 the 10.00 Euston - Wolverhampton was diverted between Rugby & Nuneaton due to engineering work and hauled by 25254 & 31287. The Ditton – Broughton Lane BOC tanks continued with its familiar pair of Classes 25 & 40, so noted were 40196 & 25254 on April 28th. 25315 & 25254 were noted on the 14.56 Ellesmere Port - Severn Tunnel Junction on July 31st. The result of 33001 catching fire on August 7th on the 17.20 Cardiff – Manchester near Moreton on Lugg led to 25254 & 25269 on the following Severn Tunnel Junction – Mossend freight being split up. 25269 replaced 33001 on the Manchester service whilst 25254 took the Class 33 back to Hereford. Two Cambrian line workings followed, on August 11th with 25282 and on September 1st with 25298. 25254 was noted at Saltley depot on August 27th. Similar to 1982, the passenger workings for 1985 had a northern flavour. The 10.09 Barrow - Nottingham on January 1st was worked to Manchester Victoria by 25254, being replaced here by a Class 31/4. A diesel multiple failure on February 12th saw 25254 work the 08.18 Melton Mowbray - Leicester and the 09.30 Leicester - Peterborough. 25254 was noted at Bristol Bath Road on February 16th. North of the border on April 15th 25254 & 25300 worked the relief 12.05 Bristol Temple Meads - Edinburgh forward from Carstairs. 25254 was noted passing through Edinburgh Haymarket westbound with wagons on April 24th. On May 1st 25254 was noted passing Llanwern with bogie oxygen tankers. On July 3rd 25254 was noted with the afternoon Manchester - Bristol parcels. On July 5th 25254 worked the Holyhead - Red Bank empty vans. 85007 came to the assistance of 25254 & 25325 at Leighton Buzzard on July 17th after both the Type 2’s failed on the afternoon Kings Cross – Tring cement empties. Overhead line damage on August 30th saw the 07.27 Wolverhampton - Euston diverted via Bletchley to Bedford with 25254 assisting. Late September and early October included several workings in Scotland. On September 27th the 11.00 Stranraer Harbour - Euston failed at Kirkconnel behind 47407, 25254 assisted to Dumfries where 47151 took over. On September 30th 25254 worked the 13.45 Glasgow Central - Carlisle, whilst the next day (Oct 1st) 25254 took over the 06.55 Preston - Glasgow Central from Carlisle because the booked Class 47 had failed earlier at Preston. A week later on October 8th 25254 worked the 14.00 Carstairs - Edinburgh (portion off the 07.47 Cardiff - Glasgow) and the 18.10 Edinburgh - Carstairs (portion for the 18.10 Glasgow - Manchester). The final passenger working for 1985 took place on November with the 09.25 Lancaster - Liverpool between Lancaster & Preston after the Class 87 failed. 25254 and another Class 25 were noted passing through Leeds on November 29th was bogie oil tankers. 1986 was the last year in service for 25254, a number of passenger turns were handled. The failure of 85040 at Wigan North Western on March 6th 1986 whilst working the 11.00 Stranraer Harbour - Euston saw 25254 take the train to Crewe. On June 3rd 25254 worked the 21.42 Preston - Liverpool Preston Liverpool (portion off the 18.15 Glasgow - Manchester). On June 14th 25254 was noted working the Holyhead RTZ - Humber empties, normally a Class 47, very rare for a Class 25. On June 21st 25254 was parked on the London Road curve, Derby. A Blackpool North - Preston turn was worked on July 28th 1986 (to Euston or Stranraer?). 25254 was north of the border for its final two recorded passenger workings, on July 31st 1986 with the 17.55 Carlisle - Glasgow Central and the next day (Aug 1st) with the 07.40 Glasgow Central - Carlisle. 25254 was noted with ballast wagons at Bangor on August 17th. September 2nd saw 25254 & 25266 noted at Leeds with westbound oil tankers (Hunslet - Stanlow empties?). 25254 was withdrawn two days later. Page added July 4th 2013. Last updated February 22nd 2019.